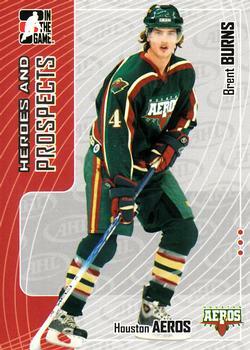 A late bloomer in the hockey world, Burns only played one year of major junior hockey before his draft year in 2003. Burns was a member of the Couchiching Terriers in the OPJHL during the 2001/02 season, with 11 points in 46 games it was good enough to get him noticed by OHL as he earned a contract with Brampton for the following season. He spent the entire 2002/03 season with the Battalion, scoring 15 goals and 40 points in 68 games but he really came alive in the playoffs leading them in goals (5) and points (11) in 11 playoff games. 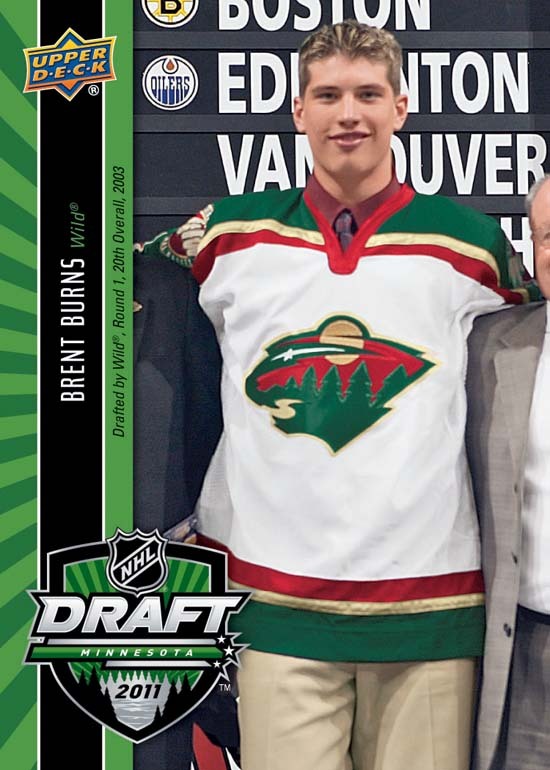 Scouts were starting to notice Burns developing into a great power forward, and that lead to him being a 1st round pick in arguably one of if not the best NHL draft of all time. Speaking of that 2003 draft, the first round was absolutely stacked and the names speak for themselves: Marc-Andre Fleury (1), Eric Staal (2), Thomas Vanek (5), Ryan Suter (7), Dion Phaneuf (9), Jeff Carter (11), Brent Seabrook (14), Zach Parise (17), Ryan Getzlaf (19), Brent Burns (20), Ryan Kesler (23), Mike Richards (24) and Corey Perry (28). The names go even deeper in the 2nd round, Patrice Bergeron (45), Shea Weber (49), Corey Crawford (52), and David Backes (62). These are some of the best players in the NHL today, what always shocks me is how the Ducks got Getzlaf and Perry in the same round only 9 picks apart! Going back to Burns, the interesting thing about his situation is before he was drafted he was always a natural forward. When the Wild selected him 20th overall, the brilliant defensive mind of Head Coach Jacques Lemaire envisioned him playing defense and turned Burns into a rare forward-to-defenseman project that is rarely seen in the NHL (see Scotty Bowman/Sergei Fedorov: http://www.thehockeynews.com/news/article/scotty-bowman-sergei-fedorov-could-have-been-an-all-star-defenseman). While Burns had very little experience playing defense, this was a move that would end up shaping his career into one of the best defenseman in the NHL today. Burns made the Wild out of training camp heading into the 2003/04 NHL season as an 18-year old, despite playing only 36 games he showed glimpses of his potential during his rookie season with 1 goal and 6 points. He was ready to take the next step in his career going into the following season, but things changed quickly when the NHL/NHLPA couldn’t reach a new CBA deal and a lockout ended up cancelling the entire 2004/05 NHL season. Luckily for Burns, he was still eligible to play in the AHL, where he had 11 goals and 27 points in 73 games for the Wild’s AHL club the Houston Aeros. With the lockout over and done with heading into the 2005/06 NHL season, Burns was out to prove that he was good enough to be a full-time NHL player and would say goodbye to the minors for good. After the lockout and a full year in the AHL, Burns showed that hewas ready for big minutes in his 1st full season with the Wild. He had 4 goals and 16 points in 72 games in 2005/06, and followed that up with 7 goals and 25 points in 77 games in 2006/07. However, Burns really started to show glimpses of his offensive firepower during the 2007/08 season, where he scored 15 goals and had 43 points (both career highs) while playing all 82 games for the Wild. As his career looked to be really taking off, multiple concussions and a shoulder injury limited him to just 59 games (27 points) in 2008/09 and 47 games (20 points) in 2009/10. He got back on track the following year, scoring a career-high 17 goals and 46 points in 80 games in what would end up being his final season in Minnesota. 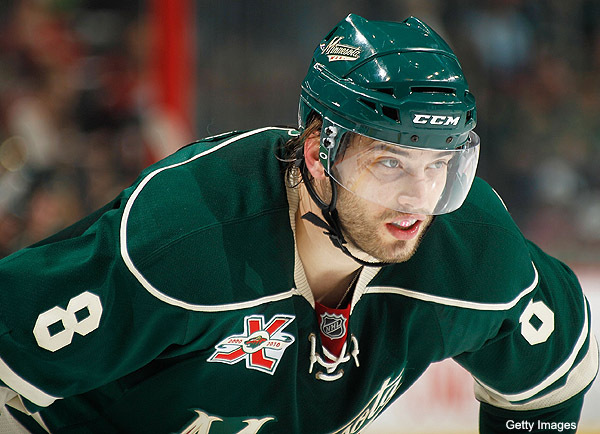 In 6 seasons with the Wild, Burns scored 55 goals and had 183 points in 453 games. Following the 2010/11 season, Burns was dealt to the San Jose Sharks (along with a 2nd round pick) at the 2011 NHL Draft in exchange for Devin Setoguchi, Charlie Coyle and 1st round pick. With just 1 year left on his current deal, he was immediately signed to a 5-year $28.8 million extension locking him up in San Jose through 2016/17. Burns took time to adjust to his new team after the 1st trade in his career, and he put up just 11 goals and 37 points in 81 games in his first season (2011/2012) in San Jose. For the 2nd time in his short NHL career, Burns was faced with another lockout and the 2012/13 season was cut short to just 48 games. After starting the season slow with no points and a -5 in 6 games, Burns was hurt in Dallas and missed 2 weeks of the short season. With the emergence of rookie D Matt Irwin on defense, Burns was moved back to his natural forward position by Todd McLellan upon his return from injury. 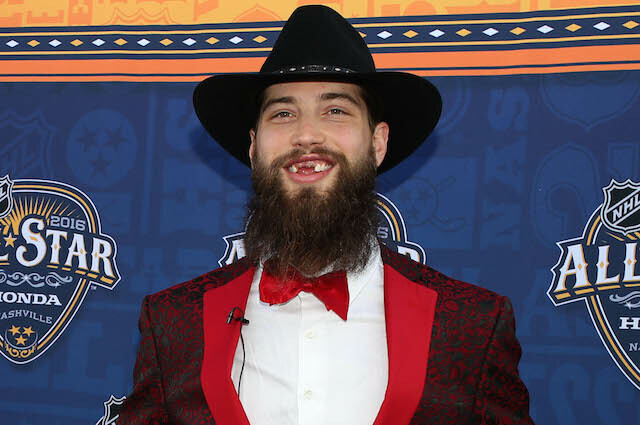 In what looked like a brilliant move from McLellan, Burns paid immediate dividents on forward scoring 9 goals and adding 20 points in 24 games following his injury while adding another 4 points in 11 playoff games. He remained at forward during the 2013/14 season, playing on the top line with Joe Thornton and Joe Pavelski he put up a career-high 22 goals and 46 points in 69 games (missing 13 games due to a freak infected gums injury). The Sharks ended up losing to the Kings in the 1st round of the playoffs after leading the series 3-0, and that lead to big changes in San Jose during the summer of 2014. Burns was moved back to defense in hopes that he could still contribute offensively but make the Sharks a much tougher team to play against, and that’s exactly what happened in the 2014/15 season. Burns scored 17 goals while adding a career-high 43 assists (60 points) in 82 games for the Sharks, including 24 PP points and 245 shots on goal. He followed that up with his by far his best season this past year, scoring an NHL-best 27 goals for defenseman while adding a career-high 75 points in 82 games. Burns also had a career-best 30 PP points and a whopping 353 shots on goal, both good for 2nd in the NHL. Things continued to roll for Burns in the playoffs, scoring 7 goals and adding 24 points in 24 games as the Sharks fell just 2 games short of the Stanley Cup. He capped off his career-year being nominated for the Norris Trophy, which was eventually won by Kings defenseman Drew Doughty. Burns has represented Canada 6 times in his career, playing in the World Juniors (2004), World Championship (2008, 2010, 2011, 2015) and the World Cup of Hockey (2016). He had 6 assists in 6 games for Canada at the 2004 World Juniors, where Canada would win Silver after a heartbreaking loss to USA in the Gold Medal game. He was then a big part of Team Canada at the 2008 World Hockey Championship, with 3 goals and 9 points in 9 games as Canada again won Silver while he was also named best defenseman in the tournament. After 7th place in 2010 (5 assists in 7 games) and 5th palce in 2011 (2 goals 2 assists in 7 games), Burns helped Canada to Gold in 2015 (first since 2007) with 2 goals and 11 points in 10 games again being named best defenseman in the tournament. After being nominated for the Norris Trophy in 2015, Burns played his way onto a spot on Team Canada in the first World Cup of Hockey since 2004, where he had 3 assists in 6 games en route to another Gold Medal. In 45 career junior/professional international games for Canada, Burns has 7 goals and 38 points while winning 2 Gold Medals. Burns has been an All-Star 3 times in his career, once while a member of the Wild (2011) and twice as a member of the Sharks (2015, 2016). 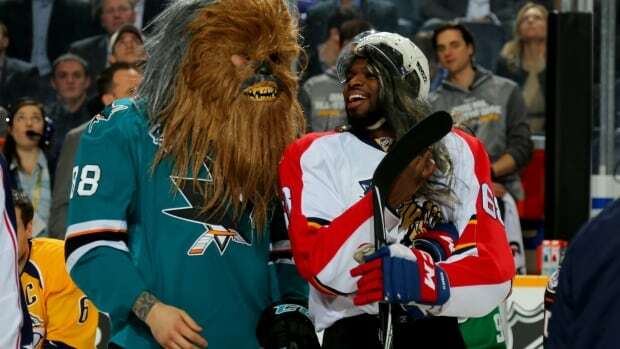 He stole the show during the Breakaway Challenge at the skills competition this past year, dressing up as “Chewbacca” from Star Wars for one attempt and including his son Jagger (coolest name!) and Joe Pavelski’s son Nathan during another. Here is a full video of the Breakaway Challenge: https://www.youtube.com/watch?v=5xmIDM-l5o0. While he’s certainly known for his play on the ice, Burns took home the NHL Foundation Award in 2015 for passion and dedication off the ice giving back to the community (https://www.nhl.com/news/sharks-burns-receives-nhl-foundation-player-award/c-772054). As mentioned above, Burns was also awarded best defenseman at the World Hockey Championships in both 2008 and 2015. There’s no question that Burns has established himself as one of the best defenseman in the NHL, but it’s his offense that has taken his game to a whole new level the past few years. In fact over the past two seasons, Burns 135 points is good for 2nd amongst defenseman in the NHL (Karlsson 148 points), while his 598 shots is tops amongst all defenseman. After winning Gold with Canada at the World Cup in September, Burns exploded out of the gate to start the season with 3 goals and 6 assists in his first 5 games. He has 3 goals and 10 points in 10 games so far this season for the Sharks, including firing an NHL-best 56 shots on goal. If Burns can stay healthy for the entire season, I expect him to go over the 80-point total (and possibly 30-goal total) for the first time in his career. 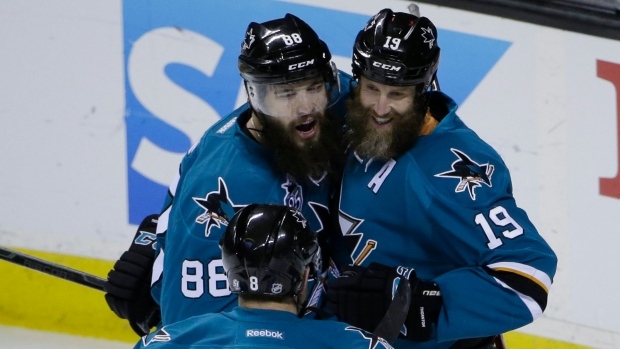 Don’t be surprised when Burnzie is nominated for the Norris Trophy again this summer. On a side-note, the “Beard Brothers” (as I call them) of Brent Burns and Joe Thornton are easily the coolest duo in the NHL today.